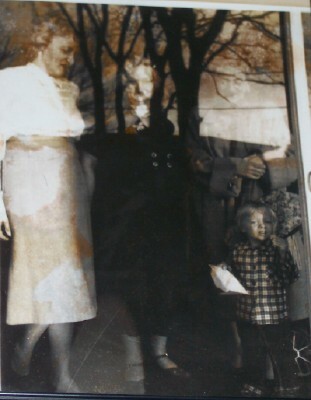 Esther Elizabeth Kimball Hibbard is shown here with her Aunt Psyche, her mother, Gertrude Miller Kimball, and me (Mom). The photographer from the Tulsa Tribune gets the credit for this 1956 photo, showing us in our states of mortality: Mother and I are clearly shown, we held out into the 21st century. Mrs. Kimball died the same year, and her sister Psyche passed on in the '60's. The reflection of the sky and the back yard Elm tree in the glass is accidental, but the significance is timeless. Kudos to the unknown Tribune photographer. In the photo we are standing inside the sliding glass door of the lower level in the New House, 3548 South Winston, in Tulsa. Esther was one of the Twentieth Century's All-Time Renaissance Women. Esther could perform on stage as a dancer, singer, comedienne or actress. 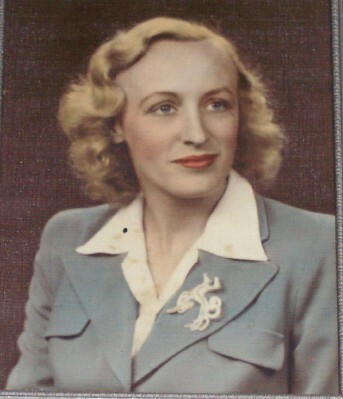 She had a college degree in a field which she had pioneered at Oklahoma College for Women, Speech Therapy. She could paint or sculpt. She masterminded every organization she joined, and she joined everything from AAUW to the Garden Club. This incredible person could add faster than a calculator, and stayed one step ahead of my 'genius' father for forty seven years. She helped charter John Knox Presbyterian Church and anchored the Tulsa Little Theatre in Oklahoma and, after 1965, The Country Playhouse in Houston Texas. Esther and Haines, (my father), were never NOT in classes for something. (In their late fifties, they both earned 'Full Certificates' with the United States Power Squadron, certifying in every offered course.) 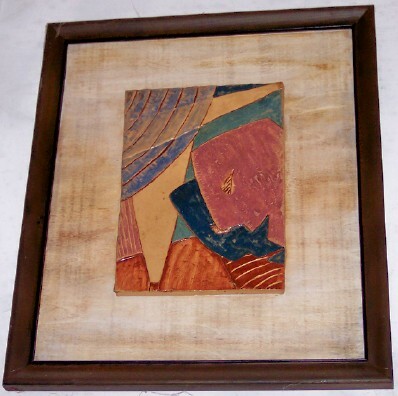 Here are a few of her works on canvas, paper, and in clay. There is simply not room on this page for the knitting, embroidery, sewing, costumes, hand made party favors, candles, dolls, toys, landscaping, collecting or crafts. The GREAT Grandmother's quilts are on display in this page. 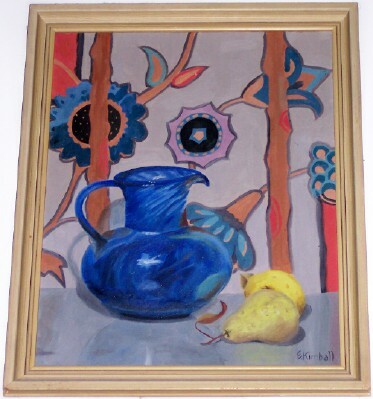 This painting is the newest, and one of the oldest. 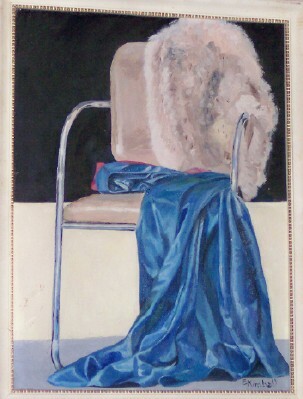 About 2004 I received a call from Mother's favorite cousin in Iowa asking if I wanted a painting Mother had given her many years ago. This one was one I had never seen, and it is so different from the others as to be a shock. So the collection is starting with what is to me the most recent, but which is probably one of the earliest works. Any question about the period of time in which this one was painted? I love it for the way it captures the 30's era so well. probably because she still could not believe what a beautiful job she had done with it. 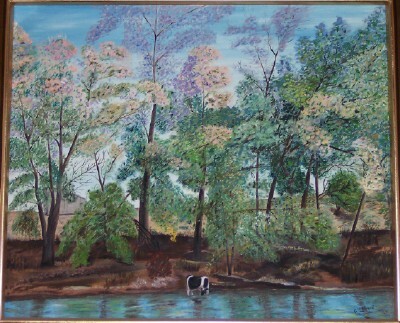 Esther was very proud of her 1960 War Eagle Fair paintings. We have photos of the river in 1998 and the trees were still there in the same configuration, but what a change in the fair! This is the Mission at San IlDefonso. 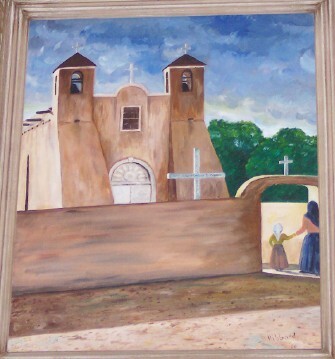 Mother was such a character, she delighted in comparing her painting of the Mission to that of Georgia O'Keef, swearing that in this painting at least you could recognize the Mission. The two figures are Mom and Granddaddy Haines cleverly disguised as other people (you can't see his cigarette either...). We visited the Mission on a Route 66 Driving trip in 1962. Anyone who got married in Mother's circle of friends undoubtedly received as a wedding present a framed and water color painted copy of the Wedding invitation they sent to Esther's house. 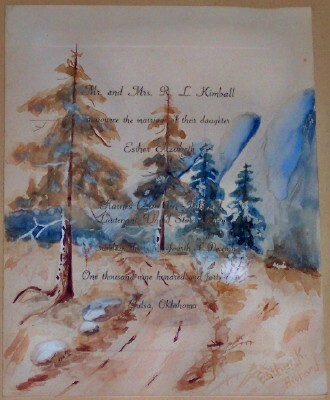 This one is Esther and Haines' wedding invitation, possibly not the first one painted in this fashion, and certainly not the last. 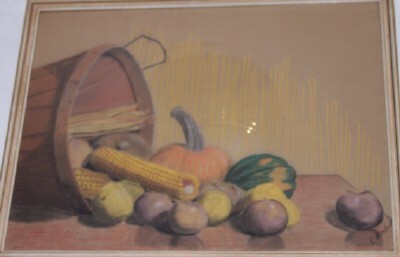 Mom remembers many of these painted when she was little, as the family friends were married. 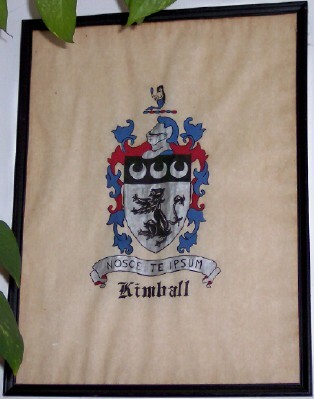 The 'Kimball' signature indicates a date prior to 1945. This is only a small sample of the ceramic work. In 1948, when the baby died, Esther went back into the art studio and threw pots. And threw pots. And threw pots. 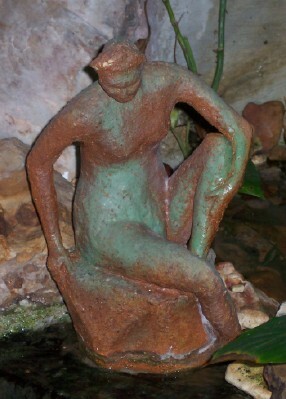 She seems to have worked off much of the grief on the clay. 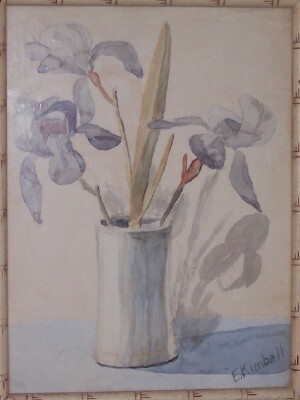 There are quite a few signed 'Hibbard', which would indicate this post-1948 period of her art study. The Punch Bowl with the twenty-four molded cups, not the least of these. 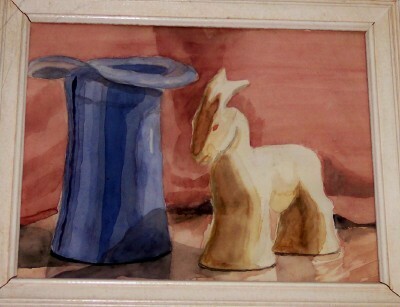 One of a series given to each family member as Christmas presents in the late 1960s. Grandma left one pot unglazed since 1940. 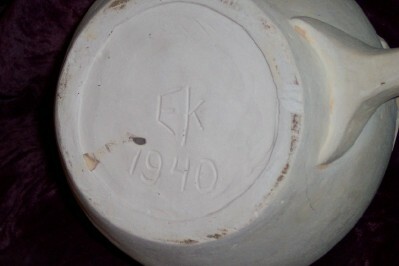 The initials "EK" on the bottom indicate, as is of course obvious, that she was not yet married to Grandaddy (They married in 1944 on Christmas eve). There were about ten pounds of Grandma's favorite clays, and several of her glazes stored in the basement in Tulsa in 1955, moved to Houston in 1965, dragged to Florida in 1983, transported to the barn in Oklahoma in 1998, and which Mom has rehydrated this last week (December 1st, 2009) to see what they will do after all these years. We are confident that Grandma would not have kept them if they were not viable. by Esther Elizabeth Kimball (Hibbard). 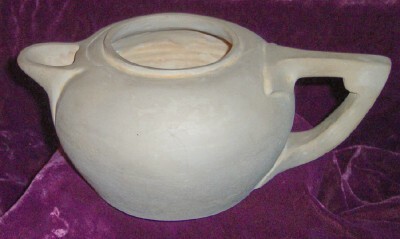 The unglazed 1940 EK pot in profile. Here it is from the top. 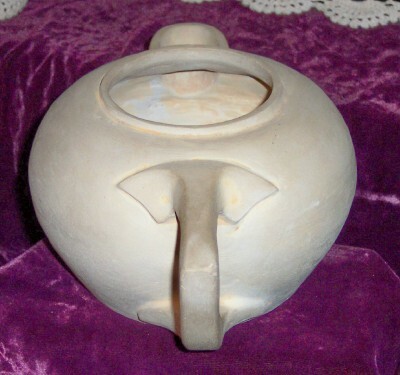 The sculpting on the spout and handle are so very much representative of the late 1930's styles prevalent at the time in which Grandma lived and when the pot was made. This angle shows the nice Art Deco carving on the handle. 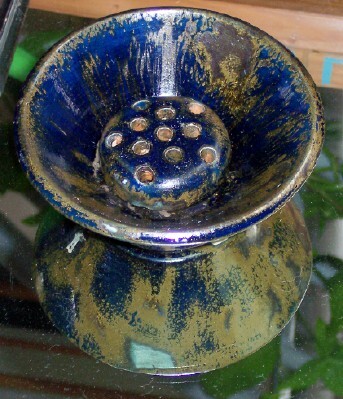 Here it is with the original glazes from Grandma's carefully preserved collection which have traveled so many miles. Esther left us her book with the glaze chemistry and sketches of her pots. 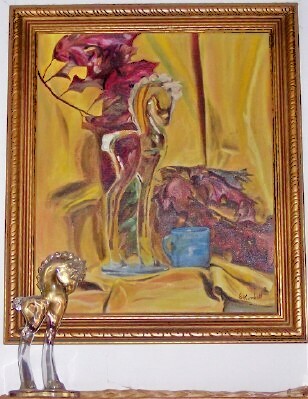 She was studying at Tulsa University in the art classes there. 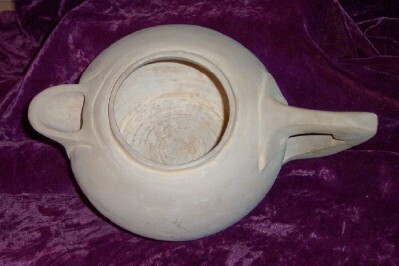 This is before firing. Mom decided to take the risk and see how the glazes will do on the pot for which they were intended. We took a vote and decided the black handle and spout with a mixture of the light blue and leaf green for the body and interior. 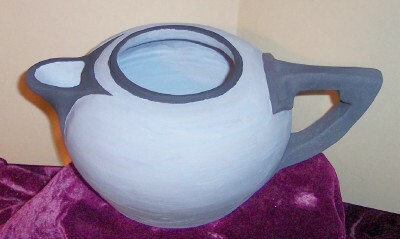 This is already in the kiln, waiting for firing. 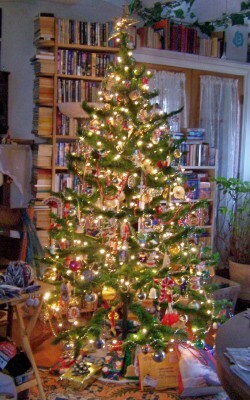 The 2008 version of Grandma's tree was so pretty...it was March 6th when the last thing went back into the box. Some of these ornaments are more than 100 years old. We miss Grandma, and her Christmas tree, resurrected the way she always decorated it (for the most part--2008 saw new lights, after more than 40 years on some of the old strings--) seems to make us feel closer to her and to Granddaddy.